Well the rumor is true! 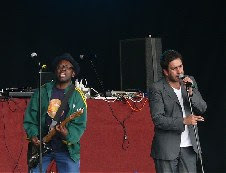 The Specials (billed as Terry Hall & Friends and minus Jerry Dammers) were the surprise act today at Bestival on the Isle of Wight. According to a post made by Roddy Radiation on his Web site, it's looking like six of the original members will be reforming and they will be touring using their own names because Dammers owns The Specials name. Jerry may take part at the last minute and apparently the door is still open but it appears doubtful he will join given Roddy's post below. Happy 50th Buster Bloodvessel of Bad Manners!